The settlement was reached following a four-year investigation by the US attorney’s office for the middle district of Florida. According to The Wall Street Journal, the attorney’s office accused the hospitals of transporting patients that did not need emergency care via ambulance to and from their homes or nursing homes when instead, they should have been picked up by taxi, friends or relatives or, when necessary a wheelchair van. 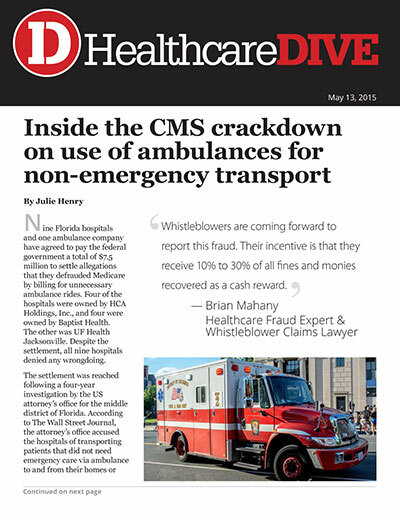 Although none of the hospitals profited directly from the ambulance rides, prosecutors argued that they benefited financially from quicker discharges and admissions. Brian Mahany, healthcare fraud expert and whistleblower claims lawyer, says at the beginning of this year, the Centers for Medicare and Medicaid Services announced that they were doing a crackdown on emergency medical services; included therein is a major push on ambulance companies that are overbilling Medicare or otherwise committing Medicare fraud. “Toward that end, companies have been charged with healthcare fraud all along the eastern seaboard from New Jersey to Florida as part of that initiative,” he says.